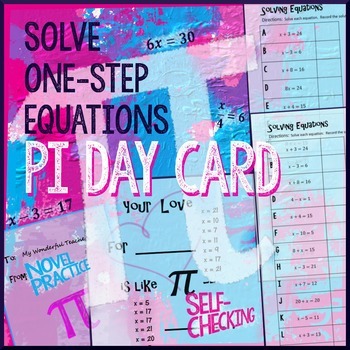 Create a few Pi Day smiles while solving one-step equations with this practice designed for 6th grade students. Only whole numbers are used in these equations. 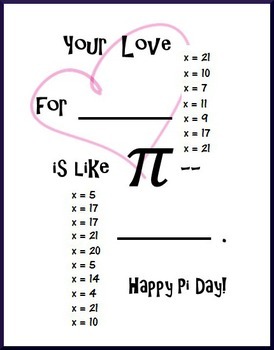 Pi Day themed answer message spices up regular practice and makes grading a snap! Practice solving one-step equations with whole number parts and solutions. Find four versions of this practice. One has 26 equations using only addition and subtraction. Another 26 equation practice uses only multiplication and division. Note that the fraction bar is used for division. The two other versions mix the first two sets for practice with all operations. Easily differentiate and meet the needs of a mixed ability class by using multiple versions simultaneously. What makes this product a must-have? ❶ Self-checking: Know at a glance if students completed the activity correctly. 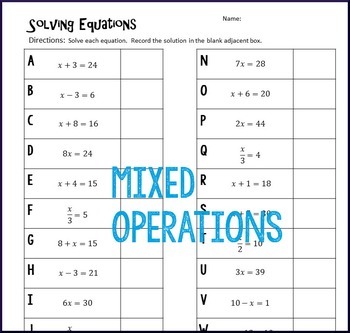 ❷ Novel Practice: Mixing-up that traditional worksheet perks up kids. ❸ Pi Day Cheer: Honor Pi Day WHILE continuing on with your current topic study. ♩ Note: Problems are identical to other holiday themed one-step equation practices found in my store. Like the idea but need other Algebra topics? ± All feedback is valued and encourages improved products. Did you know buyers also have access to future revisions?